PHOTO BY KEVIN FULLER A draft plan for the High Falls ecodistrict includes a recommendation for greater public access to the Genesee River gorge around the falls. The area on the west side of Rochester's High Falls got its start as a cluster of mills, running off the power provided by the Genesee River, but over the years it's assumed other identities. In the 1990's, for example, city leaders tried to repurpose it as an entertainment district. High Falls has since transitioned into a mixed-use neighborhood with apartments, offices, Frontier Field, WXXI, restaurants, and Monroe Community College's new city campus, which opens this fall. But people haven't stopped thinking about High Falls' potential, and another long-term vision for its future has emerged. Greentopia, the nonprofit that used to run a sustainability-oriented festival in the neighborhood, is championing High Falls as a potential ecodistrict. In simple terms, ecodistricts are neighborhoods that emphasize environmentally conscious development, programs, and services, as well as reducing their waste, energy consumption, and contributions to climate change. Greentopia is working with Highland Planning, a local consulting firm, to develop a plan for the ecodistrict, a draft of which they'll discuss during a public meeting on Thursday, June 15. The meeting will take place from 5 to 8 p.m. at Made on State, 510 State Street, and will include an opportunity for members of the public to give input. Public buy-in is crucial for the plan to work, since it wouldn't be a government initiative, says Rachel Walsh, ecodistrict coordinator for Greentopia. The plan wouldn't alter High Falls' current path. Instead, it lays out a framework for making the area a more vibrant, livable, healthy, and environmentally friendly neighborhood, says M. Andre Primus, a planner with Highland Planning. And it sets goals for doing that, such as diverting 90 percent of the district's waste from landfills, he says. "It's supposed to be community-based and ground-up," Greentopia's Walsh says. The plan is divided into focus areas, such as transportation and mobility or energy management. It incorporates or builds on some initiatives that are already under way, such as the city's bike-sharing program and efforts by both the Genesee Brewery and MCC to lessen their environmental impacts. But it also contains short- and long-term project and strategy recommendations, says Primus. 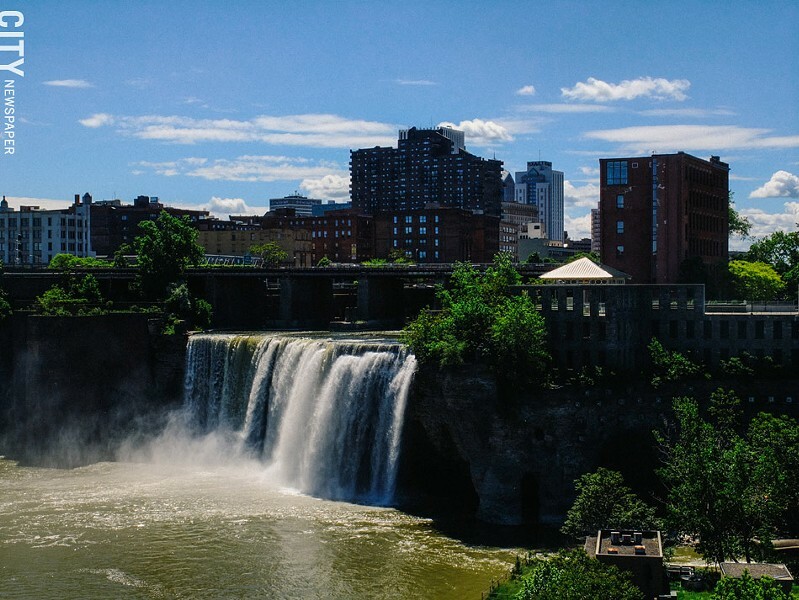 The long-term recommendations, which are generally the most attention-grabbing, include a call for improved public access to the Genesee River gorge and the waterfall itself. But the plan also suggests a district-wide microgrid powered by clean energy, ultra-energy-efficient housing, bike infrastructure, and accessibility improvements, Walsh and Primus say. Many of the short-term recommendations can be done without major government approvals, Primus says. They include upgrading buildings to make them more energy efficient and setting up a neighborhood sharing economy through swap events, Primus says. The plan also includes guidelines for setting up the group that would guide the ecodistrict effort. Representatives from the city, Monroe Community College, Reconnect Rochester, the Community Design Center of Rochester, the Rochester People's Climate Coalition, and Foodlink have had a hand in the draft plan.